Cincinnati, OH – If Bigfoot wants to protect his elusive reputation, he’ll have to watch his hairy back. 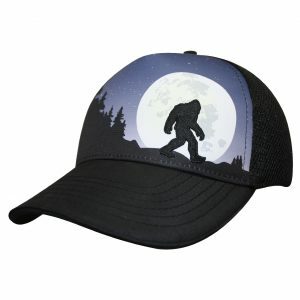 Headsweats, the leading manufacturer of performance headwear for runners and athletes is letting fans take their hunt for Sasquatch from the trails to town with an expanded collection of performance truckers featuring dozens of proprietary and customizable Bigfoot scenes. Made of Headsweats’ Eventure™ woven and technical stretch mesh fabrics, the BigFoot Trucker is designed to fit comfortably and dry quickly, whether it’s being worn on a run or out on the town with friends. A black undervisor reduces glare, while an Eventure terry sweatband wrapped in Eventure knit will keeps the sweat off of faces and out of eyes. Fans can collect Headsweat’s current collection, featuring bold scenes of Bigfoot trekking across a moonlit field or stomping across a beach with surfboard in hairy hand, or create their own customized designs. The Headsweats BigFoot Trucker Collection will be on display at the Headsweats Booth #38191 at Summer Outdoor Reatiler in Salt Lake City, UT, August 3-6, 2016. For more information, visit www.headsweats.com or e-mail julie@darbycommunications.com. Headsweats is the leader in ultra-light, supremely wicking performance headwear that dominates the triathlon, cycling, running, and endurance markets. For over 15 years, Headsweats has established itself as the frontrunner in technical headwear by combining the spirit of innovation, unsurpassed customer service and well-developed partnerships with high profile events and brands such as Team Red, White & Blue, US Military Endurance Sports, Loudmouth and Challenged Athletes Foundation. With a dedication to seeking out and using innovative materials and designs, Headsweats makes the highest-quality headwear in the industry. Keep a cool head. www.headsweats.com.